What can you see in this diagram? Could you draw it? 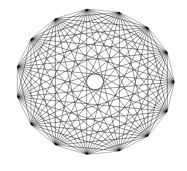 Could you draw a similar diagram with just 5 or 6 points around the outside? Try it? How many lines are there in your diagrams? How many lines are there in the original diagram? Can you find a way of working out the number of lines without counting them? Can you explain your method? Are these two diagrams the same or different? Explain your answer? Click here for a worksheet and template of circles so you can draw lines and investigate these patterns. This problem is adapted from the NRICH task Mystic Rose with permission of the University of Cambridge. All rights reserved. See also the NRICH Mystic Rose Poster.